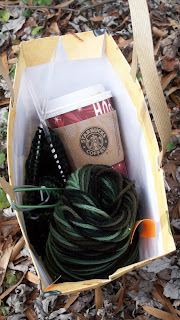 Carrying your coffee in your knitting bag is NEVER a good idea. It's not like I intended it to end up in there but somehow it did. Good thing I take my coffee black because after a ride in the car this half filled cup of decaf Holiday Blend ended up in the bag and upside down. When I discovered it, the bottom of the bag was saturated and the pattern was pretty much a goner. The little camouflage raglan inside is intended as a gift for the big brother of the baby that is getting all the attention around here so it is going to need a good bath before gifting. I have to say knitting on the coffee soaked sweater is not all bad. It actually smells rather yummy. 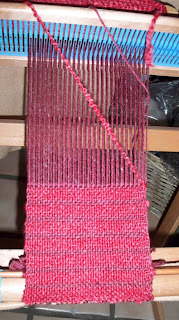 Although it is sitting right here in the middle of my living room, I have been completely neglecting my loom. 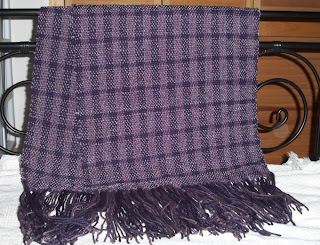 I had the purple throw on it completed for at least 2 months until I found the time to cut it off. I was handed a bag of leftover yarn at work on the last day before the blizzard hit and was taken by a red (it looks pink here but it is red) boucle. Aware of my time limitations, I began a simple scarf just to keep the poor little thing from being bare for the holidays. 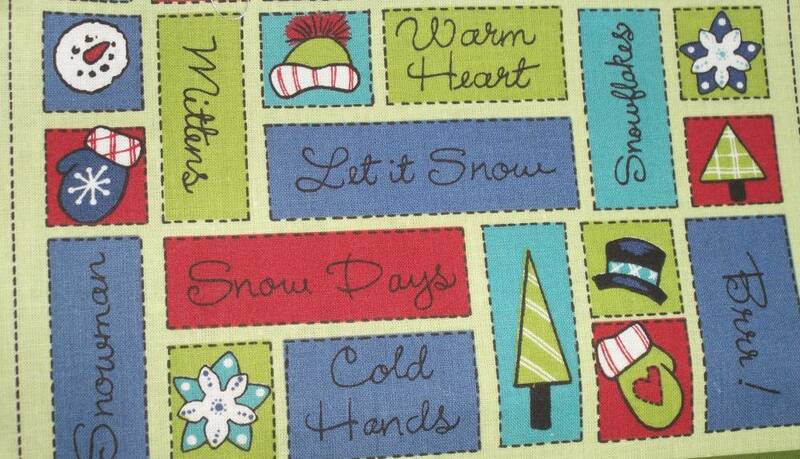 Now that I am looking at it, I am wondering why I didn't just pull out some green and make a holiday scarf. Hmm. After a major effort I finally got the itty bitty Aran finished just in time to try it on the poor unsuspecting little thing. He wasn't exactly overwhelmed with the whole deal, in fact, he never woke up. 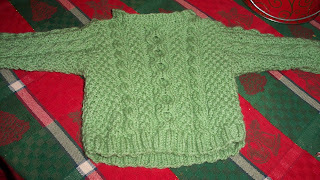 It seems that sweater that I had initially declared too small to finish may fit him in a few more months. 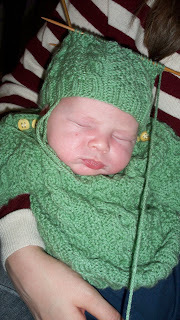 As for the hat, it is way too small so after a major frogging it's back to square one. 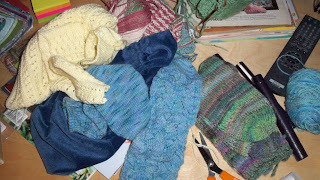 This mound of knitted material was piled on my coffee table December 22. I took advantage of a blessed snow day and sat on the couch until it was all finished and ready for blocking. All but my little Leprechaun, that is. In spite of a marathon effort, newborn baby Austin/Gage will have to wait a few more days for those sleeves and matching hat. Talk about your cool handmade Christmas gifts. 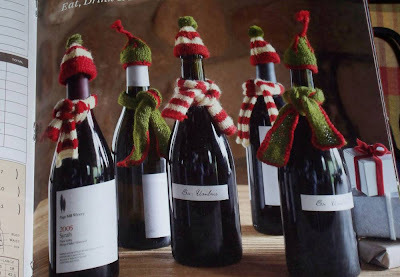 Who wouldn't want a $10 hat and scarf for their wine bottles? 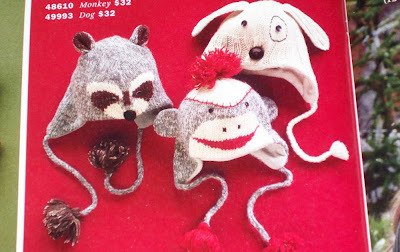 Or a fabulous $32 sock monkey hat? Watch out everybody on my gift list. Who knows what next year might bring. All gifts courtesy of Sundance, home of some pretty crazy knitted thingamabobs. While I'm off fighting with my family over whether we should order Chinese or go ice skating today, I thought I would share some of my favorite holiday memories-the ones involving a handmade horror that is worth its weight in gold. Growing up, we had a solid paper mache ornament that was the size of a grapefruit on a string that we called the "clunker ball". 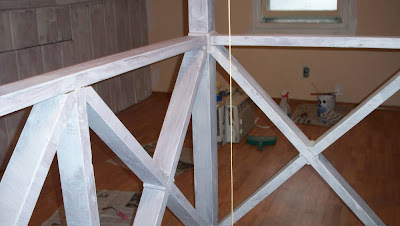 It was made in school by my sister and weighed so much it would pull over all but the sturdiest Christmas tree. 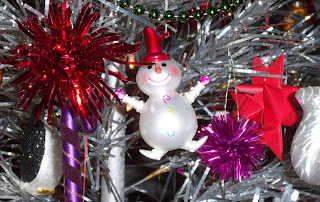 Each year we laughed at it as we pulled it out of the ornament box along with the glittery egg carton bells and milk carton candles that we iced with Ivory Flakes. Finding new ways to display that giant tempera coated softball, without causing anyone bodily harm, was a favorite activity. 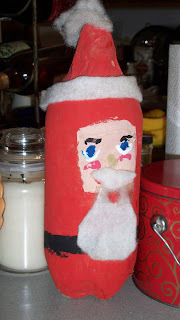 Fast forward 30 years and for my family it is the soda bottle Santa with the scotch taped beard. He has been sitting on top of the fridge each Christmas since goodness knows when. He seems to have lost his nose. I don't even remember who made it. If you know, send me a comment so I can give credit where it is due. 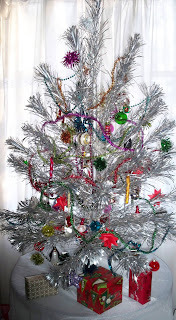 I always put my tree up at the last minute as I have this "thing" about having to clean around the Christmas tree. Trees that gather dust are just wrong. My little vintage pom pom tree gets a present every year for her lovely branches. 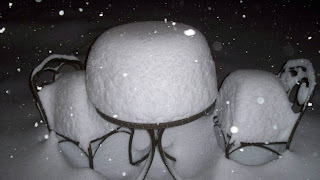 This year it was a set of happy snowmen. Little did I know when I bought them how appropriate they would turn out to be for this particular December. 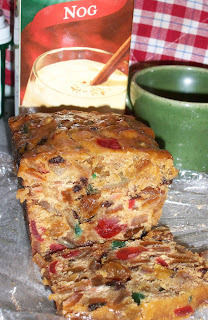 I LOVE fruitcake. Really. Deal with it people. Christmas card buying is always the highlight of my holiday prep and each year I suffer before the many choices. First, I have to determine the sentiment I wish to convey. Hopeful, pensive, festive, sophisticated? I spent at least an hour at the Barnes and Nobel card table before I selected this year's gem. Shopping alone, exhausted after work with my residual swine flu cough, miserable toothache and with a giant cold sore coming on, this one says it all and then some. Mewwy Chwissmiss! Sunday morning I got our official total off the little table in the front yard. 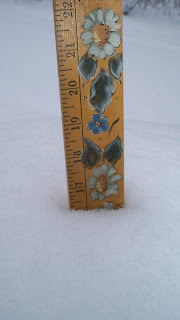 Not too shabby for the "snowpocalypse" as the weather people are calling it. 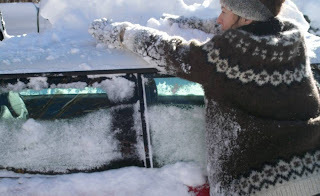 Moving that mountain of snow that fell on my Mini Cooper was not a lot of fun. At least I had my Lopi to keep me warm. I love Lopi in the snow. Nothing keeps you warmer or dryer. 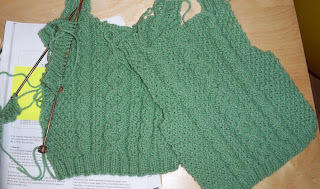 Every time I have to do this I swear I am going to knit me some Lopi leggings. 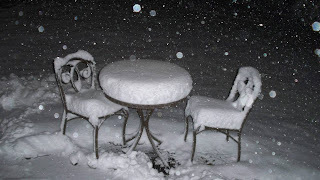 By 8 pm last night my front yard looked like this and it was STILL snowing. 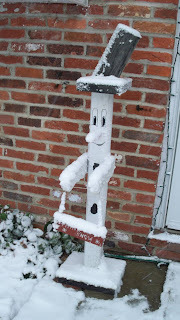 The jolly snowman was still smiling but only because he is under an overhang. 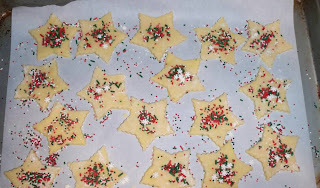 It was perfect cookie making weather so I kept my fingers crossed that the electricity stayed on. 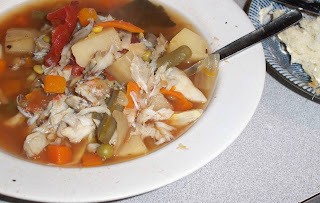 The rare Maryland snowstorm always calls for a big pot of hot crab soup. I am glad I convinced The Mister to pick that leftover dozen for the freezer back in August. 4 am Saturday morning looks like this and the worst part of the storm is not even here yet. I'm blaming it on this guy. 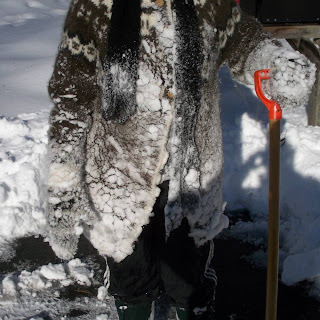 How did I spend my time preparing for the big east coast blizzard of '09? 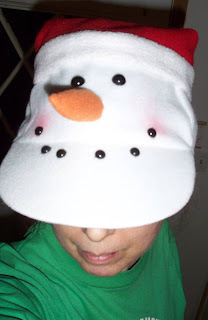 Standing in line at the grocery store for hours to buy cookie mix and silly hats, of course. 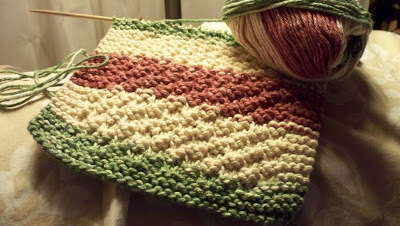 Who would have thought that I needed to swatch a cotton dishcloth? But just look at those stripes. Pretty terrible, huh? Big blocks of color don't work on little bitty dishcloths. I should have figured all that out sooner but I got caught up in a holiday moment with Charlie Brown on the TV and just kept knitting away telling myself it will all work out. It certainly didn't. I am celebrating my 56th year by taking the day off work and trying real hard to find my holiday spirit before its all come and gone. Hopefully some shopping, some baking and maybe some tree trimming will do the trick before I just give it up to my inner Grinch. 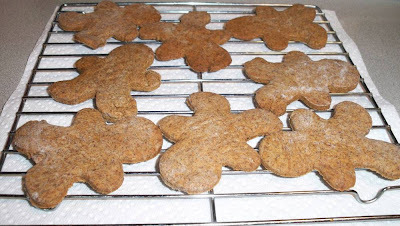 Even my poor little raggedy gingerbread guys are feeling the blah this year. 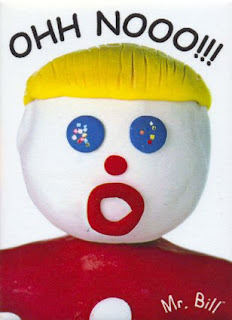 No faces or frosting bling for them because I am pretty sure they would just come out looking like Mr. Bill. 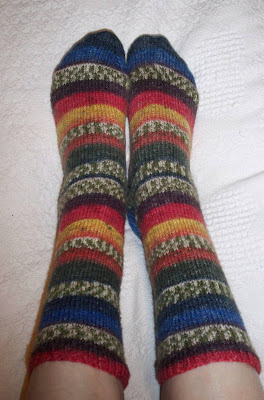 Those handknit socks my sister was wearing in her hospital bed have an interesting history. Apparently, her Bichon, Lily, took an instant dislike to them. 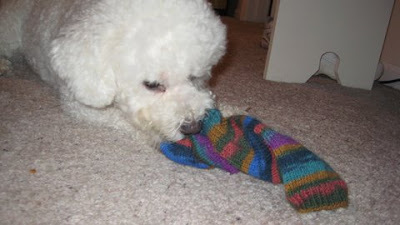 The enemy socks had to be destroyed by any means including trying to rip them off my sister's feet. No matter where she hid them the dog found them and gave them an angry gnawing. After a good washing, my sister reports that the offending smell, was removed. I did not block them before gifting and I reckon the visiting household of cats that like to sit on everything wooly may have been the problem. I should knit that dog a sweater now just to get even. 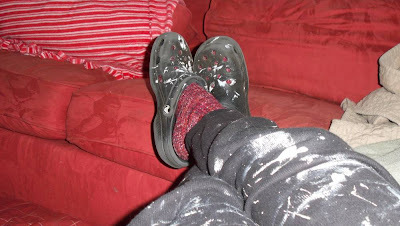 This is my not so cleverly disguised little sister recuperating in the hospital after MAJOR surgery last week showing off the plain old socks I recently knit for her. I'm thinking she must have been on some good stuff to be thinking about her socks at a time like that. I am happy to see that they came to a good use but I have to wonder what hubby was doing in there with a camera. Unless there is a new born baby in your arms, no one needs a picture of themselves in this position. Here is a hint of what I've been up to. 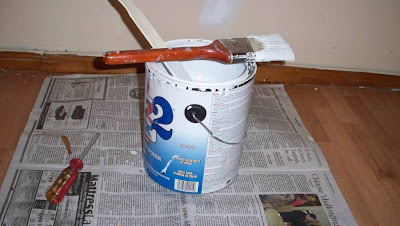 Painting over 1950 style, dark wood paneling is not a lot of fun. Especially when your little old doggie walks through those railings and falls about 8 feet onto the kitchen floor because you were stupid enough to take down the protective screening. After a frantic trip to the emergency animal hospital and a scary 24 hours of wait and see, I am happy to report that little doggie is now fine. Me, not so much. 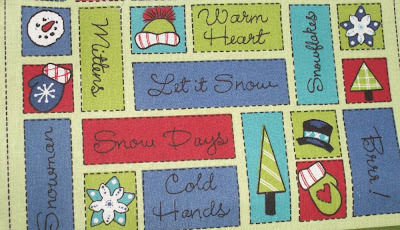 Last December I was in a tizzy trying to find some holiday themed cotton to knit some washcloths out of. I finally found some, but did I ever make those washcloths? Of course not. This job is going right to the top of the queue. Today. Seriously. 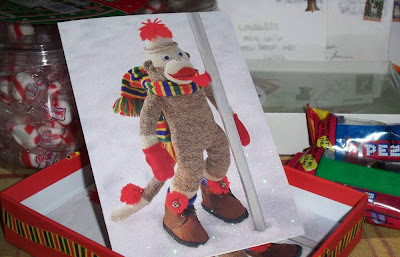 No, that is not one of my Christmas Cards. Better. 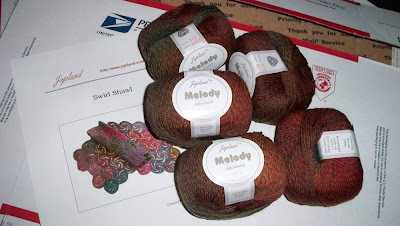 It is one of the fat eighths that just arrived from Connecting Threads. 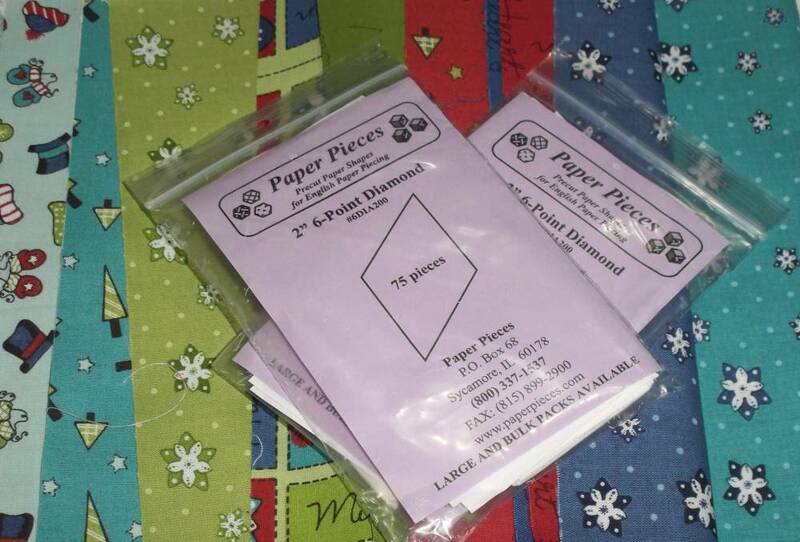 I also bought some 2" diamond paper pieces in hopes of one day having enough free time around the holidays to start a winter themed quilt. I am such a dreamer. I just had to post this picture after I read yesterday's Yarn Harlot post. I thought I had a mental defect when it came to insisting that patterned socks COMPLETELY match up. I go through lots of agonizing mathematical calculations and ripping back of Miss Second Sock in order to have the satisfaction of those little matching toes. Toes that will be hidden inside of shoes I might add. I was very happy to see that I am not the only one with this disorder. Someone needs to start a support group. First we have The Trash. When the family saw what I was doing, someone went and got me the BIGGEST trash bag in the house in anticipation of some serious down sizing. 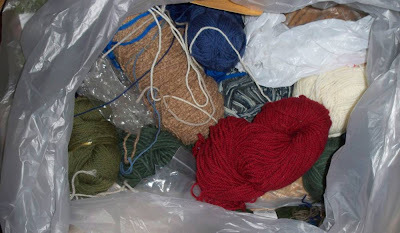 I just inherited some nice plastic bins and some cabinets from Daughter's NYC move so I decided to finally get around to organizing my mountain of yarn. In spite of all my best intentions, I only managed to part with some partial skeins of yucky stuff that I have no idea why I own in the first place. Now for The Stash. 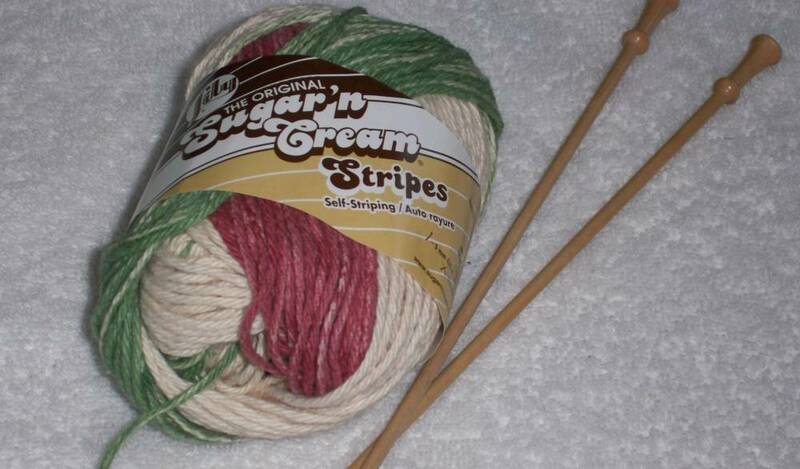 This is JUST my sock yarn. I have enough for 40 pairs. I have no excuse other than it was all over the house so I had no idea how much I actually had. It seems I can put that sock yarn obsession to rest for a very long while.